Rechargeable Led Strobe Beacon Light is an essential piece of equipment for police, firefighters, EMTs,rescue services, first responders, members of emergency response teams and the general public. The Rechargeable Led strobe beacon is constructed of durable plastic, with 16PCS super bright LEDs and magnet base. 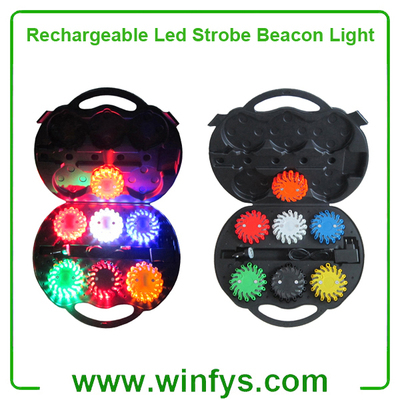 The Rechargeable Led Strobe Beacon Light is for use in any vehicle. No disposable batteries required.The LED Strobe Beacon that does not produce a flame, smoke, or harmful bi-products and does not require batteries! It is rechargeable and it is ready for use when needed.